As I get a little bit older, I try to make better choices about the meals I serve myself and my family. I love food though, and my kids can be picky eaters, so any lighter choices I make have to retain the same delicious flavor that we crave. 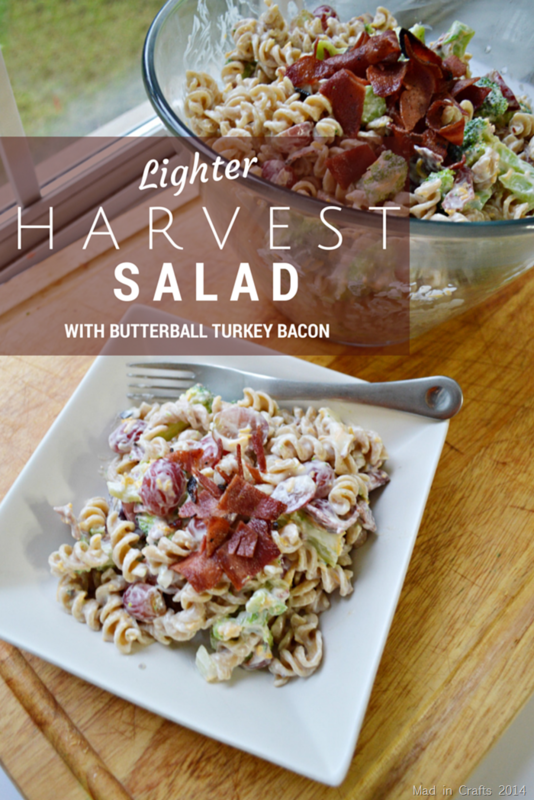 I love harvest pasta salad, but the bacon and mayo that go into the traditional recipe is a bit frightening. I have put together a lightened version of the recipe that still tastes amazing! 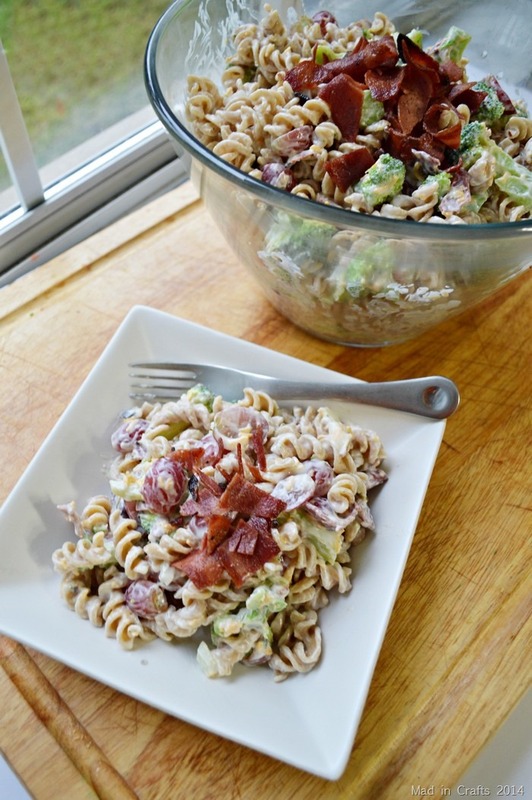 To lighten up the pasta salad, I swap out the mayo for fat free Greek yogurt and salad dressing. 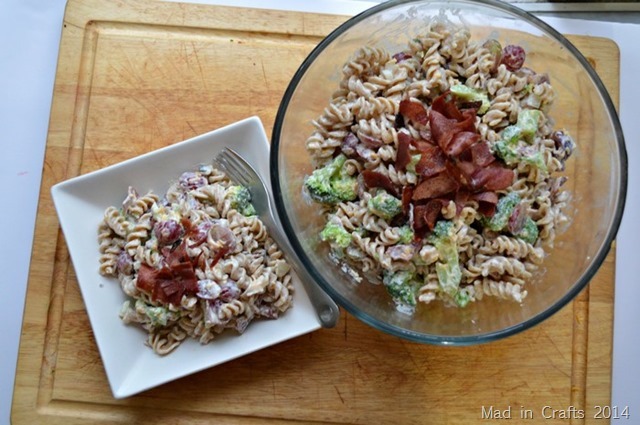 I substitute whole wheat pasta for the traditional white flour version, and I use turkey bacon instead of pork bacon. Turkey bacon is far leaner than pork bacon, but still has the smoky, salty taste that this dish needs. By substituting turkey bacon into the dish, and swapping out some of the other ingredients, you can make a version of this delicious dinner that is better for you. I like to make to make this as a weeknight dinner, so that we can enjoy the leftovers for the rest of the week. It’s one of those meals that gets even better as it sits in the fridge. Since the recipe makes such a large batch, you can also bring it along to a potluck or picnic where it is sure to be a crowd favorite. 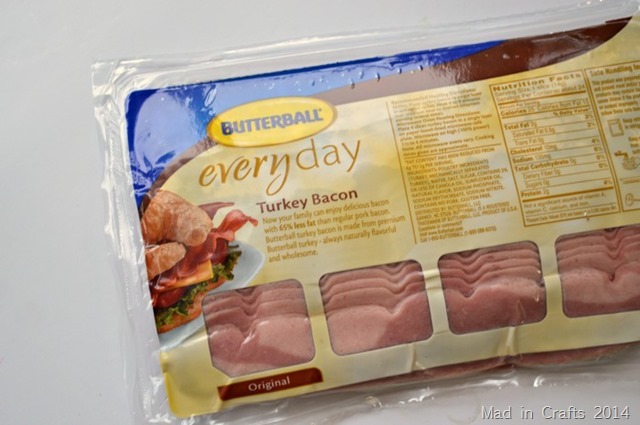 You can find Butterball coupons on their website, along with many other Butterball recipes which offer lighter versions of recipes without sacrificing flavor. Cook the whole wheat pasta according to package directions. Drain and let cool. Cook bacon according to package directions. Drain, cool, and chop. Cook broccoli, cool, and chop. In a large bowl, mix together yogurt, salad dressing, and vinegar. 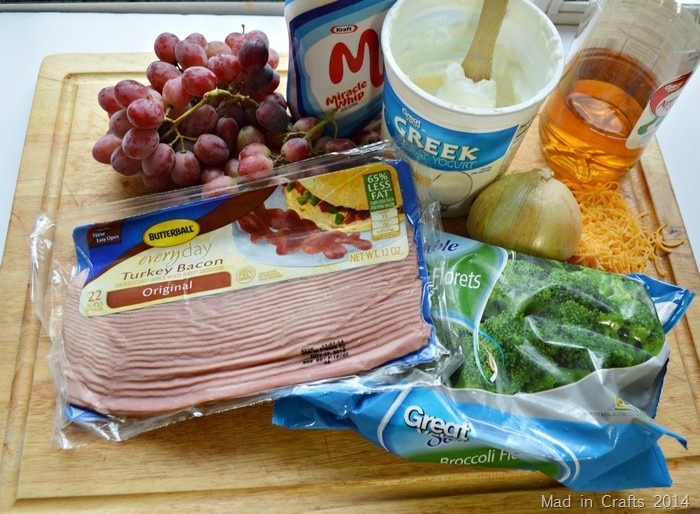 Stir in onions, grapes, cheese, cooled broccoli, and cooled pasta. It looks delicious! I love pasta salads! Yum! Looks delicious…my mom, sis, and I love pasta salad. Will have to try this one!